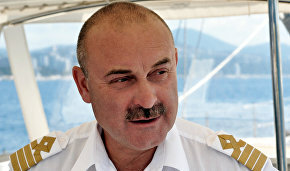 Yacht captain Nikolai Litau has several trips across the Arctic under his belt. The year 2016 was no exception: his yacht, the Northabout, traversed the entire Arctic, from England back to England again, in a single navigation. Arctic.ru asked the seafarer about the particularities of yachting tourism in Nordic conditions. — Why the Arctic? Why have many of your trips taken place in this cold and inhospitable part of the world? — I did not come to this out of the blue. I had done a lot of traveling and wanted to try everything: I traveled on snowmobiles, horses, and of course did some nautical tourism. The latter appealed to me the most: I did not have to carry anything with me, I simply loaded my stuff and off we went. And the yachts, of course. I came to the yacht club, began taking lessons and trained to become a captain. And then I met Dmitry Shparo… He invited us to a party at the children's geographical school, where we spoke to the children, and told them about the 1992 expedition when we helped an English yacht to find its way from the White to the Black Sea. After the meeting, we stayed on to talk, and Dmitry asked if we had any ideas for a journey. I mentioned a trip along the Northern Sea Route. Dmitry was very enthusiastic about the idea, and we began to prepare for the journey together. We spend a long time building a yacht, until finally, on August 9, 1996, we launched the Apostol Andrey into the water. Many yachtsmen dream of sailing around the world. But this has been done: both into the wind and against it, non-stop and by oneself, and in many different ways. But no yacht has crossed our Arctic, and there are reasons for this. The Belgian Willy de Roos was a pioneer in crossing the Canadian Arctic zone. As for the Russian Arctic, foreigners were not allowed in and Russians could not afford yachts. But then it all became easier, and this is when sailing around the world became highly popular. And I decided that if I wanted to change my life for something, it must be something completely unprecedented. This year, on November 14, we are celebrating 20 years since our first round-the-world voyage, which was up to sail along the entire Northern Sea Route aboard a yacht. — During your first circumnavigation you came across some difficulties in conquering the Arctic, didn't you? — We succeeded only after two years. We started late, there were numerous breaks, so we could only complete our Arctic crossing in 1999, after starting in 1996. In 1998, we tried to sail across the Arctic, but it was a completely different Arctic from what it is today. There was far more ice and we only traveled across the eastern part. It took us many weeks of patience: we were anchored for five weeks waiting for the ice to disperse. We managed to slip through to Tiksi, where we spent the winter. Next year, in 1999, we completed the navigation, which made the Apostol Andrey the first yacht to travel the Northern Sea Route in two attempts, with a winter break in Tiksi. Three years later, our yacht became the first Russian yacht to sail across the Canadian Arctic. We had an informal race around the Arctic that year: Germany's Dagmar Aaen yacht with Arved Fuchs at the helm had already traveled through the Canadian Arctic and came to our Arctic, while we went the opposite way. Our Arctic was not at all patriotic and had no ice in store for Fuchs, who passed through the Northern Sea Route in one go unhindered. While in the Canadian Arctic, we had it all! We drifted, stuck in the ice for three days. We were squashed and the ice broke the rudder blade and we had to replace the wind stick. We crawled through the Canadian Arctic one mile at a time. We sailed for a day, and hid for two-three days, and then went on again. Thankfully, the Canadian Arctic Archipelago is full of bays, which provided good shelter. In the end, in 2002 (the same year), the two competing yachts, the Dagmar Aaen and the Apostol Andrey, completed their Arctic circumnavigation. But the Germans exited the ice two or three weeks before us. Then the Arctic began to change, with the ice melting…. In 2009, the son of my crew member Daniil Gavrilov came to me and said he wanted to go along the Northern Sea Route. I told him it was worth trying to "do the Arctic" in one trip. In 2010, the guys went, at the same time as a Swedish catamaran ship of the famous [Norwegian] Arctic explorer Borge Ousland. Both crews went around the Arctic simultaneously, and now Norway believes they were the first, and we say we were. Anyway, 2010 was the year when the Arctic was first conquered by a yacht in a single navigation. This year, we've done the same thing, covering both Arctics onboard the Northabout. — You were the captain of this expedition? — Yes. The Englishman David Hampelman organized it. He also travels to the poles all the time, the North Pole and the South Pole. In 2000, if I remember correctly, he was the first to reach the North Pole in a balloon. David bought a yacht named Northabout. To date, it is the only boat to have traveled twice to the Arctic. 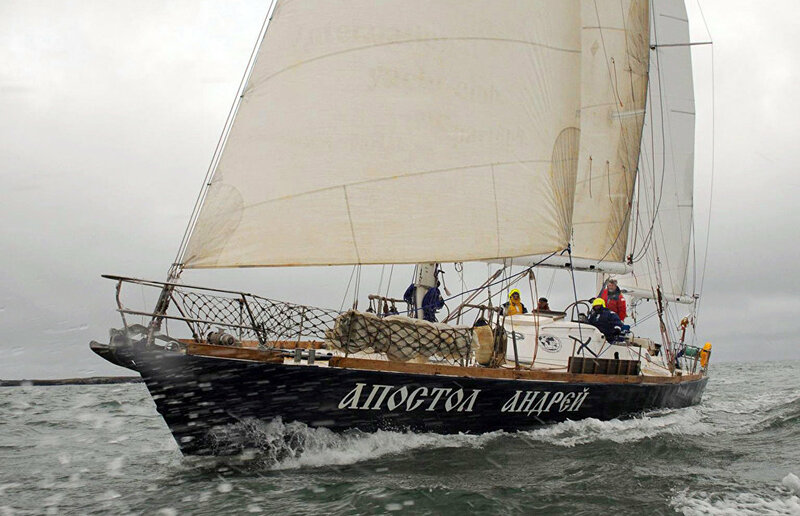 In 2004, the yacht took this route with one wintering, as did the Apostol Andrey. Last year, David contacted me, and invited me to help him sail along the Northern Sea Route. The fact is that when one travels, in addition to natural obstacles, there are plenty of man-made obstacles as well. A foreigner may have hard time understanding them. 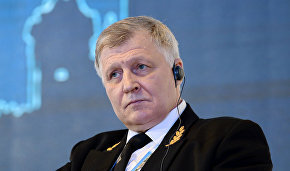 There is also a condition that a ship's captain, in order to obtain a permit to travel along the Northern Sea Route, must have experience of at least three months as a captain or first mate on the Northern Sea Route. People with such track record can be counted on the fingers of one hand, because the Northern Sea Route does not have many yachts. One or two boats per year tops. That's why David invited me. Last year, when David started all this, I felt that they wouldn't make it. When it became clear that it was a non-starter, he suggested that I come to England to meet the team. Last year, I brought them to Spitsbergen (Svalbard). This year, we traveled across the Arctic, but I was unable to start with them. I took the yacht in Scotland, not in Bristol, because there were problems with obtaining a permit to sail, and I had to stay in Moscow for an extra couple of weeks. I took the yacht to Greenland. In Greenland, a New Zealand captain took over, and I flew to Murmansk. Although, of course, it would be a good thing to take them to England and to close the circle. The Northabout became the fourth yacht that managed to cross the Arctic in one navigation. But since it did so twice, the yacht and me are the only ones to have traveled this route twice — one time in three navigations, and next time in one navigation. — Were there any emergencies during the trip? — Of course, there's less ice in the Arctic now, and we have it much easier, but you can still get into a situation. This year, there was plenty of them. In the Laptev Sea we got caught in a storm — I have never seen a storm like that in my entire life in the Arctic. In the summer, storms can happen, but they never last long. As a rule, the summer is a fairly quiet season in the Arctic. We tried one strait, it was shallow waters, and the ice came close to the shore. The Northabout is equipped with a lifting keel: if you lift the centerboard, the draft will decrease by one meter. So, even with the raised centerboard we sat on our belly at a depth of 1.4 m. We couldn't make it between the shore and the ice — they were too close to each other. The forecast said an eight-point storm was coming. We went to a shelter, chose a good place, and dropped anchor. The forecast was for a storm, they said it would be 8 points. We changed the spot, gave some slack to the chain, and anchored securely. Wind goes up to about 8 or 9 points (9 points is considered a normal storm), the anchor kept the boat in place, but it started to thrash around, but we were ready for that. Suddenly, the wind became a real storm with gusts up to 78 knots, or 40 m/s, whereas a hurricane officially begins at 32 m/s. The chain rattled, and started running. The windlass wasn't holding. My mate Denis Davydov and I quickly ran upstairs. Denis rushed to the anchor to secure the anchor chain, I started the diesel engine and dashed to the steering wheel, so that in case the chain snaps, I could immediately head back to the straits which we used to get to that spot, and help the anchor chain while doing so. We were fighting for the life of the yacht and our own for three hours. Our leader immediately gave an order to put on life suits. You fasten them tightly, and depending on the temperature, you can stay alive a couple of hours in the Arctic waters. The closest island was close enough, so in a couple of hours at least the bodies could have made it there. They were ready to leave the yacht being scared to half-death by what was happening outside. However, three hours of fight were not in vain, and we managed to keep the boat at anchor. Then, the wind started to subside. We went downstairs with Dennis to check the instruments. It is still a 9-point storm overboard. But after 12, it seemed that everything became quiet. It was the critical moment. If the chain snapped, we would have to run from there. I think that we would have been able to take the yacht out of the straits, because with today's navigation, it's easy to do. The entire track is saved, and all you have to do is to retrace your way back to safety. But there was ice lying ahead of us. There was nowhere to go. It's not an open sea, you know. I'm not sure what we would do there with the headwind. In the end, we managed to stay where we were. The storm broke the ice and drove it away from the shore, so the next day we started out and went, at normal depth, to the next island, where we spent a few more days waiting for the situation to improve. — So sailing through northern seas is still dangerous? — This is certainly not an expedition like the ones in the past, when sailors were not aware of the depth beneath them or what lay ahead… Today, I have a sense that you can take a couple of professionals aboard — and the rest can be good-for-nothings — but they will still be able to say that they conquered the Arctic. When I was preparing my first trip to the Arctic, I selected a crew about the same as Amundsen did in his own time. He had clear requirements — no older than 50, not younger than 35, with some skills. My guys had to be within the 30-50 bracket. Perhaps, that's because I was 38 then. Of course, everyone had to be a yachtsman, except the doctor, who was supposed to take on the galley. For many years, I abided by that rule. Later, I started taking younger and older people aboard as I myself was getting older. Our oldest crew member will turn 70 next year. He has stayed away for three years now, but he was fairly active before he turned 65. I had three ladies, a 14-year-old teenager and a leader who knows little about yachting on my team this year. David suggested that I take my mate. This, of course, was a reasonable thing to do, because you have to do an around-the-clock watch. I sized up this team and took my mate Denis Davydov along. The two of us and the autopilot, that's all there was to it… However, the autopilot already broke down on our way to the Kara Sea, as its "brains" went haywire. The yachting autopilot receives information about the direction from the magnetic compass. The magnetic compass does not work properly in high latitudes, because it has a horizontal magnetic component, which rotates the arrow and goes to zero at a time where the vertical component increases strongly. When we went into the Kara Sea, the magnetic compass simply failed. That was it for the autopilot. Denis and I split the 24-hour period between us into watches six hours each, and got everyone at the helm so that they could learn how to steer. It was fairly windy, with the wind reaching up to 7 points at times, and we had to train the entire team in such circumstances. You should have been there to see what they did in the beginning. However, all of them learned to steer to a varying degree of success, which came handy later when we entered the Laptev Sea. At that point, no autopilot could make it in principle, because there was ice all around, and you had to maneuver between the ice floes. By the end of our trip, everyone learned to steer well. — So sailing in the Arctic is still for the professionals? — You need to be able to steer the boat, especially if it has sails. You need to be able to steer by compass and to chart a course. You also need to be able to handle the sails given the weather and everything else. In the Soviet era, if you became a yacht captain in five years, it was good, since many were unable to get the papers even in a longer time span. There were three stages — Class II helmsman and Class I helmsman. Before each stage, you had to learn some theory, meet the maritime criteria, perform certain exercises, and pass these exams, which was not an easy thing to accomplish being face to face with these old sea wolves, your examiners. Now, there are all kinds of schools where you can get your Bareboat Skipper papers allowing you to charter a boat and take your family and friends aboard. Of course, not everyone ventures to the high latitudes, because going there requires people who know how to do it.